One of the old guard who should move over for youth, or the finest unfulfilled talent of his generation? 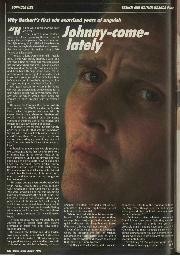 Mark Skewis takes a look at Johnny Herbert's F1 career. Of the ridiculously small percentage of racing drivers who make it to Formula One, precious few ever win a Grand Prix: fewer still get to achieve that feat in front of their home crowd. 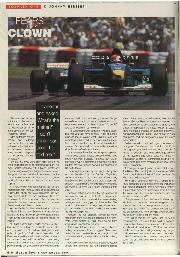 Which was why, when Johnny Herbert crossed the line to win the 1995 British GP there was hardly a dry eye in the house. Except those of Flavio Briatore. Notwithstanding the Benetton MD's hug, and rumours that Herbert's victory had fulfilled a performance clause at the very race it was due to expire, the Briton's career was already back on skid row. British Formula Three Champion in 1987, he could do no wrong, Benetton rewarded his progress with a Formula One test on the Brands Hatch Indy circuit. Stepping from a machine with 180 bhp on tap to one boasting 900, within 30 laps was six tenths faster than regular pilot Thierry Boutsen. His star was in the ascendant. Subsequent including one which saw him faster than Nelson Piquet in a Lotus, led to designer Gerard Ducarouge hailing the Essex sensation as "the next Senna" and Benetton signing an option on his services for 1989. By then, he also seemed destined to graduate to F1 with the European F3000 mantle to his credit. 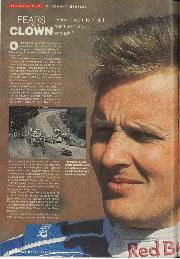 Herbert's courage was the equal of his talent In Peter Collins, team manager at Benetton, it found the ideal foil. In spite of his new recruit's shattered legs, Collins persuaded Luciano Benetton to give him a chance. The Italian wasn't convinced. It wasn't hard to see why, lifting Johnny in and out of the car was such a performance that in pre-season testing the mechanics had to bring him lunch in the cockpit. His fourth place in the intense heat of Rio, on his GP debut, was nevertheless the stuff of legend, but where he was able to slow the car by using the gearbox in Brazil, the return to European circuits betrayed his inability to exert more than half of the required pressure on the brake pedal. Non-qualification for the sixth race of the season, in Canada, prompted his dismissal. Throughout the whole ordeal, his sense of humour at least remained intact. Collins vividly recalls the first time Herbert returned to an F1 car after leaving hospital. "It was Silverstone, in winter, and pouring with rain," he explains. 'Sandro (Nannini] set a time, Johnny did an installation lap, then three more laps all of which were slow before coming back in. 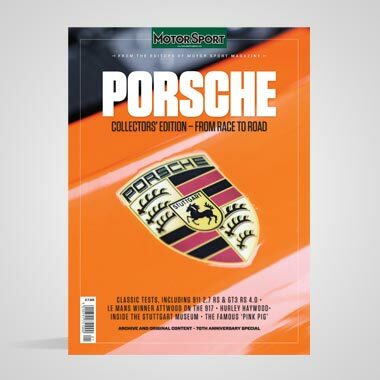 The car was pushed into the garage and he just stayed there, slumped in the cockpit "
I leaned in and asked, 'What's the matter?' I don't think I can do it,' he told me, really subdued. I asked him if he would give it another go, and he agreed. He did three quick laps, bang, bang, bang, came in, and said, 'Got ya!" Perhaps that is why, when Jean Alesi profited from retirements to win in Montreal last year, it was portrayed as long-overdue reward for his mercurial talent. When Herbert won not once, but twice, he was widely perceived to have lucked into victory. "Everybody said Silverstone was a popular win," he reflects. "I thought, 'If I'm so popular, how comes I didn't get any credit for it?" Herbert might not feel compelled to prove himself every time he ventures out of the pit lane, but you wonder whether some observers expect it of him. One friend is convinced that without the accident Johnny would already have been World Champion twice. Irrespective of whether you believe that optimistic declaration, there is no doubt that on occasion not least the Barcelona test which heralded his second stint at Benetton he has given tantalising glimpses of the natural speed people were convinced would carry him to the top. Instead. it is not so much his damaged legs, as his damaged confidence, which has hindered his subsequent career. "I remember when I was doing F3000 it just didn't matter what I did. Everything was such a flow," recollects Herbert. "It was just all going in the right direction." So much so, in fact, that when he awoke in hospital his first concern was not for the state of his iniuries, but whose fault the accident had been. Reassured, he slept once more. "I think if the accident hadn't happened, I would be a better driver now," he maintains. "I was on a high and everything was going so well. When you're on a roll, your confidence just grows. "But I effectively lost three years before I really got back into it. Even when I felt okay, I know it was in the back of people's minds. 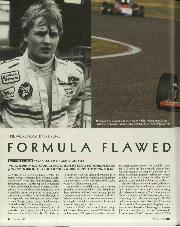 When I was at Lotus and out-qualifying Mika [Hakkinen], who was the golden star of '91, I still didn't get the recognition. There was still this thing about, 'Is he over his accident?" "Mr Ohashi was asking me, 'Are you sure he's okay?' he recalls. "I was saying, 'Yeah, yeah, of course' but if you saw him in the morning when it took Johnny half an hour to get out of bed, and another half-hour before he could walk you would have thought I was crazy. But whenever he was in the car, in the tests or for the race, he flew. And he was the easiest of the three drivers on the car. He played his part." After partnering Volker Weidler and Bertrand Gachot in the first win achieved at the Sarthe by a Japanese manufacturer, Herbert collapsed on the car out of sheer exhaustion. "By then his eyes were sunk right back in his head, and he looked as if a feather would knock him over," smiles Kennedy. 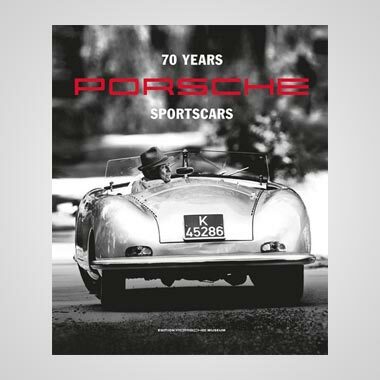 "At Le Mans, mental and physical fatigue are your biggest enemies. I asked the girls in the team to take Johnny away from the pits whenever he was out of the car, just to get his mind off things. He just thought he was really popular!" At times, Herbert has been popular. But despite interest both from Frank Williams and Ron Dennis, it is Benetton which has twice presented him with what appeared to be the big break. On both occasions it failed to work out. The first time, his fitness let the team down. Last season, he feels Benetton returned the compliment. Yet despite having been dismissed more times by Flavio Briatore than Graeme Hick has by fast bowling, Johnny intriguingly says he has no regrets. That sounds like somebody being brave. Not so, he insists! "If I hadn't come back, hadn't finished fourth in Rio, I would never have got back into Formula One at all," he points out. "If I had said, 'I will give it a year or two, to get fully fit,' who would have taken me? 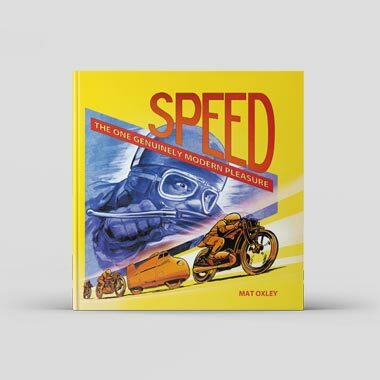 Everyone would have said, 'Well, he's had a shunt, and he hasn't been in Formula One...' I used to lay there at night and think to myself that one day the pain would go away, but all the time I continued to race and test, it actually just got worse. To get sacked was upsetting, but now I realise that coming back saved me. As did Peter Collins. Without PC and Lotus I wouldn't be here now. "The second time with Benetton, it was the sort of risk that you just have to take. A lot of people criticised me for saying what I did last year, and complaining that I had no support from the team, but if I hadn't said that I would have been attacked anyway. People would just have written me off as slow. Formula One is very fickle." 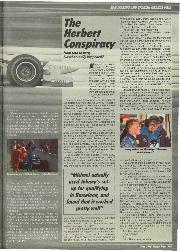 As indeed was Peter Sauber, who procrastinated over a close-season choice between Herbert and countryman Mark Blundell. The Swiss team owner confesses that his preferred option was the latter, but that the two victories swayed the sponsors in Herbert's favour. "I was slightly worried by the things Johnny had said at Benetton," admits Sauber. 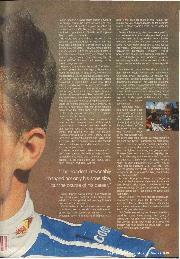 "Especially because he was coming from a team with one very fast German, Michael Schumacher, to a team with another. I thought Heinz-Harald [Frentzen] might be too much for Johnny. But it hasn't worked out that way." Initially, it looked a case of out of the Benetton fat and into the Sauber fire, for the Ford engine was weak and Frentzen received the same testing privileges as those enjoyed by Schumacher. The tension culminated in a huge row, since which Herbert has shared the testing and his speed rattled his highly-rated partner. Ironically, he has probably earned as much recognition from his speed in relation to his teammate, whilst battling for tenth, than he did from winning two Grands Prix last year. "I told you F1 was fickle," he laughs, before putting on a serious face to suggest: "I've driven better this year than last, by a long margin. I don't have to be leading a race to know that I'm driving well." But, sadly, the rest of the world probably does, for people rarely bother to look further than the results sheet. Like so many natural sporting talents the likes of George Best, for instance Herbert has often been accused of squandering that ability with a lack of application. 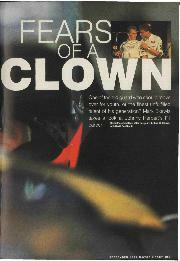 At times, notably at Lotus, there were good grounds for such talk. Max Welti, his team manager at Sauber, says he has no such complaints, and the suggestions leave his driver exasperated. "After Mika left Lotus, I tried to get more serious." he argues. "I've always known that if something is missing from your feedback, you lose a couple of tenths immediately. I give my all in briefings. Where I do my laughing and joking away from that, its almost seen as if I'm not committed enough. It's my way of getting rid of the pressure. That's how I cope with it outwardly." Others, you suspect, go home and kick the doe. The likes of Damon Hill just kick themselves. "With Damon, for instance, I wouldn't even go near him when he's under pressure!" Hill is still on course for the World Championship. At 32, Herbert is four years his junior but well aware that, without a top berth, time is running out for him. The question marks still loom large even if he has the talent, does he have the confidence and the motivation to harness it? "People seem to think I don't want it bad enough, which is a misconception because being champion is something that I've always dreamt of, and still want to achieve. I think I've got a lot more to prove. If you are content, you're not going to give everything: you shouldn't be in a car any more. 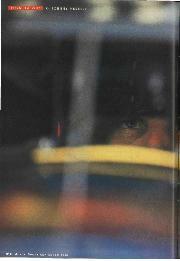 "I'm still in this to win races, and to win a championship. It's going to be hard to achieve. because I got harmed a lot last year, but I've got to somehow try to turn it around. Whether I ever will or not, I don't know, but I will give everything I've got until the time comes when there is no chance left," The fire may still burn. Herbert may have the belief. The big question is whether others have the same faith.